SouthPaw and volunteers renovate Westland Hills in Albany during 2011 '4 in 24' program. TROY, NY- As the Tri-City ValleyCats, Class-A affiliate of the Houston Astros, prepare to enter their 11th-season in the Capital Region, they've announced that they will be teaming up with BlueShield of Northeastern New York to create the Community Grounds Crew. This crew will lead the 2nd ever '4 in 24' Program and also assist in renovating numerous other youth fields from April through September. The '4 in 24' renovations will take place in early April, with work scheduled around the clock. In order to bring the selected fields to game ready conditions, each one will have new sod placed in their infield while also seeing their pitcher's mound and homeplate areas re-built. "The entire ValleyCats staff is thrilled to continue the '4 in 24' program in 2012, while expanding our outreach by introducing the Community Grounds Crew. This program will allow us the opportunity to continue our efforts in providing safe fields of play for the youth of the Capital Region," said ValleyCats Vice President/General Manager Rick Murphy. The 'Cats are no strangers to undertaking field renovation projects. It has been an annual tradition since the program began with the restoration of a little league field in South Troy in 2003. Each year since, the ValleyCats organization has reinforced their mission to provide safe and well-maintained fields for youth sports organizations throughout the Capital Region. This task was expanded with the first-ever '4 in 24' program in April of 2011. That project saw fields in Albany, Ballston Spa, Schenectady, and Scotia restored with crews working around the clock. 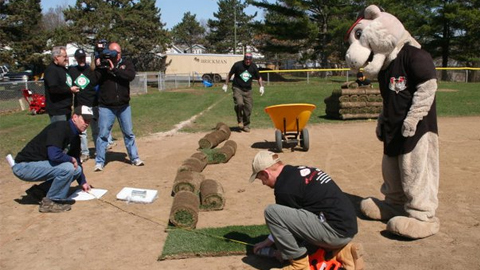 With the help of BlueShield of Northeastern New York, the ValleyCats will once again expand this mission further in 2012 by creating the Community Grounds Crew. As the presenting partner in this initiative, BlueShield will be a critical contributor to help give back to the youth of the Capital Region. "We are thrilled to partner with the ValleyCats to restore four local baseball diamonds, so the children of our community can enjoy one of our country's national past times," Brian O'Grady, vice president, BlueShield of Northeastern New York, said. "Our company takes pride in the thought of kids playing catch or running the bases with friends, because they will be taking time out of their day to engage in healthy activities - and as we all know - Healthy Changes Everything." These projects will also be supported by the New York-Penn League Charitable Foundation. Contributions to the foundation have come from past events such as the Capital Region Craft Brewers Festival, hosted by the ValleyCats and Brown's Brewing Company, and the Corporate Cup Tournaments which have included teams from local and regional businesses. Leagues interested in having their field considered for this project must complete an application that can be found on the Community Grounds Crew page of the ValleyCats website. The deadline for '4 in 24' submissions is March 9th with the chosen fields announced on Friday, March 16th. The leagues who are not selected for the '4 in 24' project will remain in consideration for the Community Grounds Crew program, which will accept and evaluate applications on an on-going basis through September of 2012.